Yesterday I lunched with two of the rock star teachers in my life (shout out to Liz Prather and Vickie Moriarity) and, of course, we talked about teaching, our students, and the state of education. I came away with lots of ideas and inspirations, as I always do when I talk with awesome educators, but one thought really resonated with me because I had a really good week in the classroom. I think perhaps one of the most important lessons a teacher can learn is that we reap what we sow. Watching my students dive deep into their classmate’s papers during workshop. There was no discussion of simple surface problems (such as spelling and grammar), but there were detailed discussions of balance, ideas, and support. My heart warmed to see two heads bent over our classroom textbook as they discussed the merits of a particular argument or whether another text might support the writer’s argument more effectively. I almost cried when someone asked for fresh eyes and three people from another writing group immediately volunteered. Observing my students brainstorming together for their next assignment, helping each other, based on their deep knowledge of each class member, to find a topic and approach that would work for each unique individual. Collaborating with my students to build a scoring guide for their next assignment and listening to their talk about writing, context, and purpose. An outsider might note that these moments were not very active teaching on my part. I was doing a lot of watching and listening. Some of these conversations were small group discussions. I tend to wander around the room, listening and interjecting if necessary and giving students the opportunity to ask me a question. In short, I am not really doing very much, but that is because I am reaping what I have sown. This sort of “effortless” group work has come about through 12 weeks of community building, modeling, guiding, and scaffolding. As I have written about many times before, if you want to create writers then you need to let them write in a community of writers. A good writing workshop session does not spring fully formed from the cracked linoleum. My students were able to provide effective feedback because we have practiced this a lot on smaller assignments and we collaborated on the scoring guide for that specific assignment so they knew exactly what a successful paper for this assignment and this class should look like. Also, thanks to weeks of discussion about our texts and our ideas and the connections and intersections among them, my students are knowledgeable readers who could ask meaningful questions and make meaningful suggestions. Similarly, if you want to create critical thinkers then you need to delve deeply into topics and peel back the layers. In my class we select a small number of readings from our textbook and then spend a lot of time with them – not just reading but connecting them to other readings as well as our lives and popular culture. My students now understand that reading is not like skipping stones but more like peeling an onion – not because I told them but because they have done it. 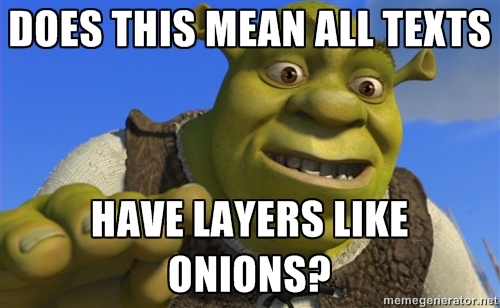 That is why they suggested the Shrek meme to represent the work we do in our class. Finally, if you want your students to collaborate and support each other in meaningful ways then you need to build community and give them the opportunity to share and to support and to celebrate. Almost every class we share either in a large group or in our small groups – often both. I mix up our groups (or teams) and try to build them with a balance of strengths and weaknesses and I change up the “team leaders” as well to give everyone a chance. Another factor is that my students award each other badges for their contributions to the class – on a weekly basis. Whether it is the badges, the small groups, or the real benefits they realize from active participation, most students are fully engaged and contributing when we are working in groups and when we come back out of the groups – something that isn’t always true before we go into groups. I believe in the truth of the above quote from Galatians and in the truth of the quote below from Robert Louis Stevenson. It is the Stevenson quote that is perhaps the root of the problem with the image problem that our education system is facing. 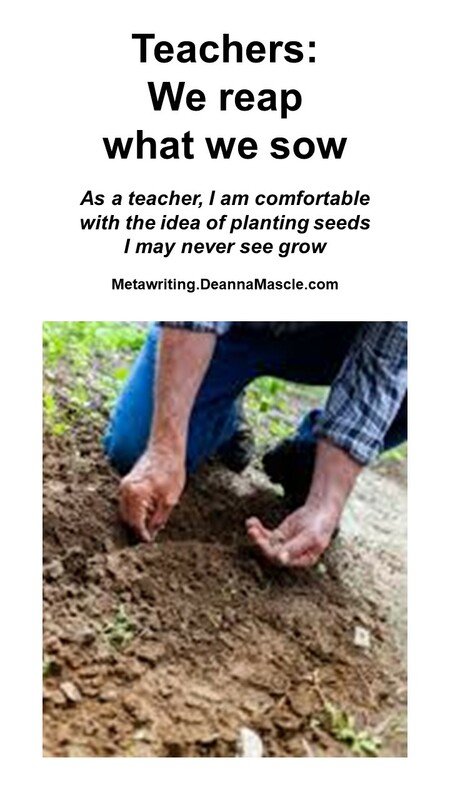 As a teacher, I am comfortable with the idea of planting seeds I may never see grow. I know that I can change a student in the 16 weeks that I have them in my classroom and that change can reverberate throughout the rest of their life. But the challenge is that change may not become apparent or measurable for weeks, months, or even years. How do I measure the change in a student who views the world in a different way when our education system does not celebrate curiousity and inquiry? How do I measure the change in a student who now comprehends that deep understanding requires peeling back layers of meaning when all the standardized tests they take require skimming not peeling? How do I measure writing growth when the only tests of writing competence are multiple-choice grammar tests or on-demand essays? The sad truth is that another educator can easily identify this growth in another teacher’s student, but the system does not respect or trust the opinions of educators when it comes to our students or another’s. How do you measure success in your classroom? Are you sowing what you want to reap? 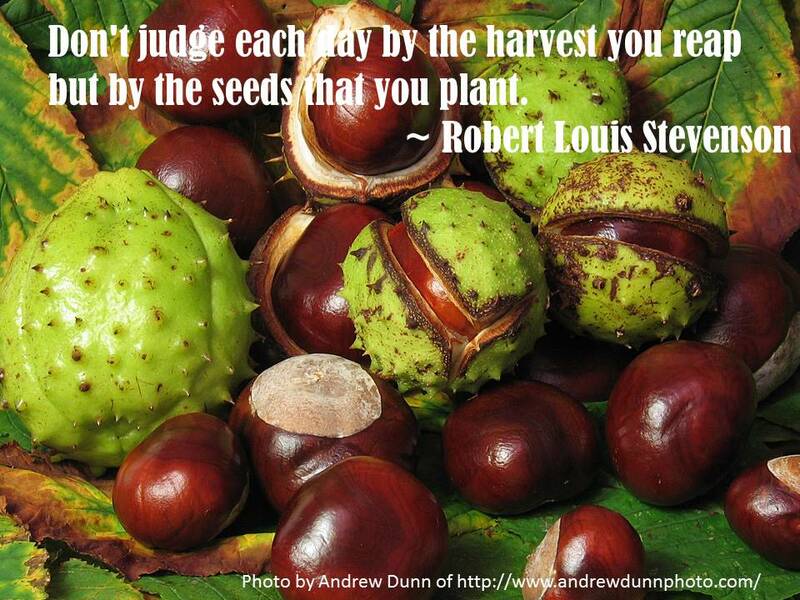 Are you planting the seeds you want to grow?